Robert Hall Brutton was born in Yeovil in 1862, one of the four children of brewer Joseph Brutton and his first wife, Elizabeth Lillington. His mother died on 18 May 1869 and was buried in Yeovil Cemetery. In the 1871 census 8-year old Robert was listed as a boarding student at Abbey Grange, a private school in Sherborne, Dorset. Ten years later and Robert was listed as a senior boy boarding at College Green School in Great Malvern, Worcestershire. By 1891 Robert had returned to Yeovil to work in his father's brewery. The census recorded him as a boarder with tailor William Milborne in Princes Street, next door to his father's house. In fact it is little surprise that Robert was boarding next door since his father had remarried and living with him and his new wife, Mary, were nine children aged between 7 and 30, as well as six servants - something of a house-full. Robert listed his occupation as 'Maltster, Brewer & Wine Merchant' while his father gave his occupation as 'Brewer, Wine & Spirit Merchant' suggesting that 28-year old Robert was running the malting works on the other side of Clarence Street. His father retired due to ill-health in 1893 and moved to Eastbourne, Sussex, and Robert took over as Managing Director of the brewery. By 1911 Robert was listed as a Brewer, living at 15 The Park, with three servants. 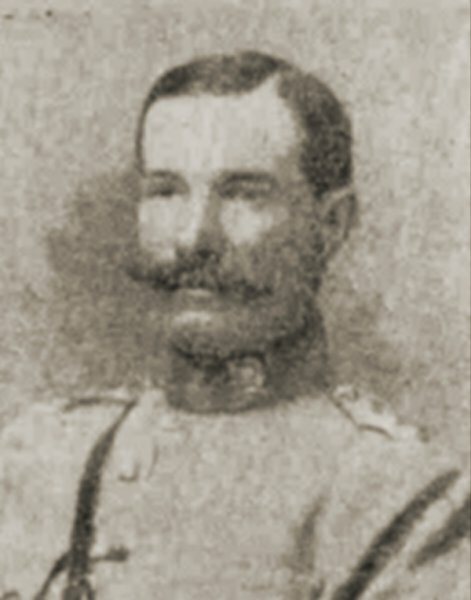 Robert Brutton was for many years an officer in the local volunteer force, joining E Company of the 2nd Volunteer Battalion, Somerset Light Infantry in 1895. This unit later became the 1st/5th Battalion, Somerset Light Infantry. He was promoted to Captain in 1902 and major in 1910. At the outbreak of the First World War he was mobilised while on training exercises on Salisbury Plain. Part of the South-West Brigade of Wessex Division, the 1st/5th sailed from Southampton on 9 October 1914 and landed at Bombay, India, on 9 November 1914. The battalion remained at Jubbulpore until December, when it proceeded to Ambala. Strenuous training began almost immediately and continued almost for the next year. Diseases flourished in the chaotic wartime conditions and unfortunately, in January 1916, Robert was hospitalised with malaria. He died on 15 January 1916 at Ambala Station Hospital and was buried at Ambala Cantonment Cemetery. He was aged 53. 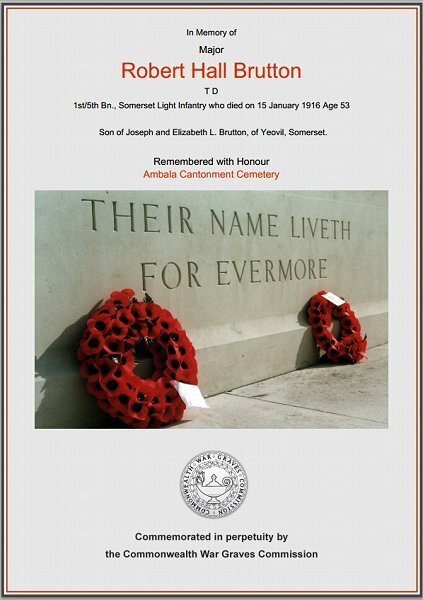 On 21 January 1916, the Western Gazette reported the following - "The news came to the town of Yeovil on Monday morning, with startling suddenness that Major Robert H. Brutton, of 15 The Park, had died whilst on active service with his Regiment in India. On the previous morning the family had received an intimation by cable that the Major was dangerously ill, and the prayers of the congregation of the Parish Church with which the family have for years been actively connected, were asked on his behalf, but the cable the following morning, announcing that he was dead, but gave no details of his illness, was a great shock to the town and district where he was a popular figure and so much respected. Major R.H. Brutton, who was 53 years of age, was the son of the late Mr. Joseph Brutton, and practically all his life had been connected with the firm of Messrs. Joseph Brutton & Sons, brewers, of Princes Street. When the late Mr. Joseph Brutton retired through ill-health 23 years ago and went to live at Eastbourne, Major Brutton took over the managing directorship, and successfully carried it on till he left on the outbreak of the war. A man of unassuming character, he was generally popular, and whilst he took no active part in public administrative affairs, he gave up much of his leisure time in public service, and his enthusiastic work with the Volunteer and Territorial Forces will always be remembered. He was for many years an officer in the local unit, formerly E Company of the 2nd V.B. Somerset Light Infantry, and latterly under the Territorial scheme, the 5th (T) Battalion of that famous Regiment. When war broke out the Battalion, in which he had attained the rank of major, was in training on Salisbury Plain, and was mobilised. After a period of strenuous training, during which the Major was awarded the Territorial Decoration (shown above left, below the badge of the Somerset Light Infantry), the Battalion proceeded, with the others of the Wessex Division, to India, where it had done much hard work. The late Major, who was a bachelor, was a great sportsman, and took an interest in agricultural matters, always being an active figure at the shows of the Yeovil Agricultural Society. He was a regular follower of the Blackmore Vale Hounds, and very fond of shooting. Some years ago when the Yeovil and District Rifle League was a live institution he took a prominent part both on the executive and as a competitor with his Company’s team. For many years he took an active part in local cricket, and was at various times President of the Yeovil Club, Captain, and a prominent player. His political sympathies were with the Unionists and the Hon. Aubrey Herbert, MP, had no more enthusiastic supporter. He was closely associated with the Constitutional Club, and served as president; in fact he held that office at the time he left for India. He was a churchman, and had acted as sidesman at the Parish Church. Thus, whilst there is the knowledge that the Major is included in the gallant band that have made the supreme sacrifice for King and country, the utmost sympathy is expressed to the bereaved relatives. 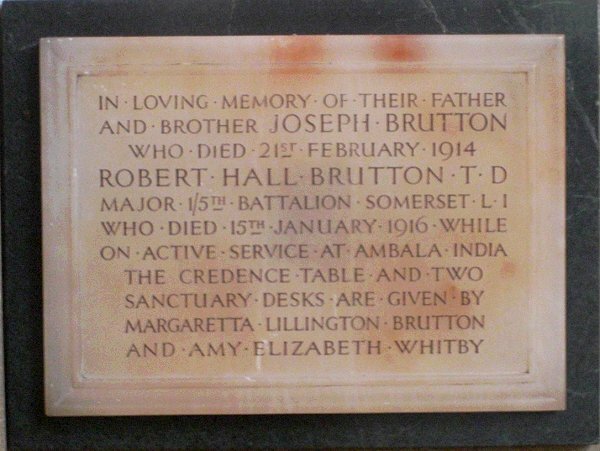 Robert Hall Brutton was buried in Ambala Cantonment Cemetery (Plot 21, Row A, Grave 2), India. His name is also recorded on the War Memorial in the Borough. Major Robert Hall Brutton's obituary. The memorial to Robert Hall Brutton, and his father Joseph, in St John's church. The Commonwealth War Graves Commission certificate in memory of Robert Hall Brutton.